Loss of output from wind turbines as they age is roughly in line with that from other technologies. Looking at an earlier claim that deterioration is much more rapid than this provides useful lessons for spotting erroneous results that could distort policy debates. Large wind turbines are a relatively new power generation technology, and not much has been published on how their output changes over time. This means that new studies can attract a good deal of attention. For example, a report by Professor Gordon Hughes for the Renewable Energy Foundation (REF) – an organisation highly sceptical of renewables, despite what its name might imply – made the extraordinary claim that load factors for wind fall by over half in their first 15 years of operation , and further suggested that wind capacity would rapidly become uneconomic, so that “few wind farms will operate for more than 12-15 years”. Such a severe decline in load factor and correspondingly short life would make wind power much more expensive than is commonly assumed. Two researchers, Dr Iain Staffell and Professor Richard Green, at Imperial College London have since taken a closer look at this claim, and found that it simply does not hold up to scrutiny . Looking at what they found provides wider lessons about how to assess extraordinary claims that might affect policy. Staffell and Green’s first step was to carry out some comparative sense checks. They looked at gas turbines, which are similar to wind turbines in that they are also large chunks of rotating metal subject to considerable wear and tear. Gas turbines typically lose output at a rate of around 0.3-0.6% p.a. with careful maintenance and component replacement, or 0.75% to 2.25% without. This is very much less than the rate suggested for wind turbines in the REF study, even if wind turbines are not well maintained, for example due to their remote locations. The next step was to look at the lifetime of existing wind turbines. The UK has 45 wind farms over 15 years old. 35 of these (nearly 80% of the total) are still operating, and of the remaining 10 only one (2% of the total) has been closed completely. The other nine have been repowered with larger and more modern turbines to increase output. Five of these wind farms had been repowered when 17-20 years old, past the operating life predicted by the REF study. These statistics simply disprove the prediction in the REF study that most wind farms would be retired after 15 years. With these results already falsifying the contention of short lifetimes, Staffell and Green looked directly at falls in output, tracking the performance of each installation over time. 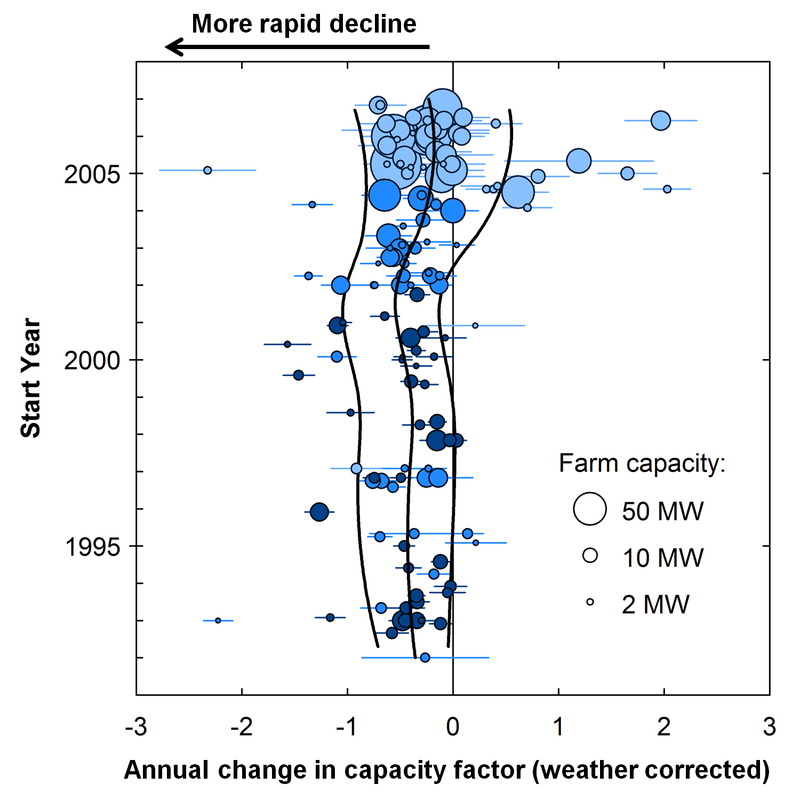 Modelling changes in output as turbines age requires correction for variations in the weather. Fortunately very detailed data on wind speed and direction is available – the study used 500 million data points from NASA. Taking this into account showed that turbine load factors do indeed fall with age, but by 1.6% p.a. (0.4 percentage points), within the range for conventional technologies and much less than the 5-13% p.a. found by the REF study. The results are illustrated in the chart below, which shows the annual change in weather corrected load factor (the absolute rate of decline) for each onshore farm in the UK against the year the farm was built. There is an apparent tendency for newer turbines to lose capacity somewhat less rapidly, but it is unclear whether there is because newer technology is more durable, or because turbines are more carefully maintained during their early years. The few that had increased output substantially (at the top right) were likely moving out of an early commissioning phase. Together these findings show that the results reported by Renewables Energy Foundation are simply incorrect, and that a material but manageable rate of output decline is to be expected from wind plants as they age, as for other technologies. In a sense this is a boring result, in that the conclusion is well supported by evidence and makes good sense with few real surprises. But it is nevertheless an important result, because it implies that wind power can continue to make a growing contribution to decarbonising the power sector. What lessons can be drawn from the comparison of these studies? The first is that often a few simple sense checks – such as what has happened with comparable technologies and whether 15 year old wind farms were actually being retired – can help identify claims that are unlikely to be true. Such simple checks were not reported in the REF study, raising immediate suspicions about the result. Second, a study that relies purely on statistical techniques, as the REF study did, rather than using physical data – wind speeds in the case of Staffell and Green’s work – is doubly suspect, because it will tend to say little about what is driving results. Third, it’s important to take account of implied information from the private sector. Experienced investors continue to put their money into wind farms. While private investors can and do make mistakes it is unlikely that the numerous investors in wind farms the world over have all either ignored or missed something as simple as rapid output degradation over time. The fact that very large investments in wind turbines continue to be made suggests there is a good deal of unpublished analysis that contradicts the REF contention. Fourth, the results of a single study should always be regarded with caution. Fifth, it is appropriate to be sceptical if results are likely to be congenial to those publishing them, as they were in the case of the REF study. There may be deliberate misrepresentation, but this is not necessarily so. Studies have shown that people are more prone to misinterpret data when doing so leads to conclusions that support their world view . Independent academics such as Staffell and Green – who work at Imperial College Business School and are not any kind of lobbyists for wind power (or any other kind of power) – can act as a useful counterbalance to this tendency. Rigorous, genuinely independent public domain work can play a valuable role in keeping climate change policy debates well-founded. The REF study is Hughes G. The performance of wind farms in the United Kingdom and Denmark. London: Renewable Energy Foundation; 2012. URL: http://tinyurl.com/cn5qnqg. This entry was posted in Climate change policy on 12/01/2015 by adamwhitmore.